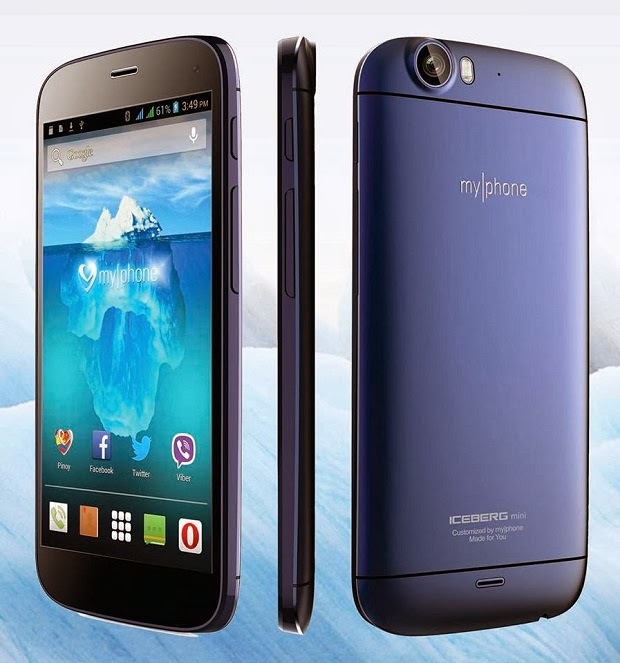 MyPhone outs the mini version of its "Iceberg" phone but confuses buyers flaunting the unit with a more expensive price. The MyPhone Iceberg Mini, though, has powerful internals compared to the bigger Iceberg. Check out the rest of the specs after the jump. The Iceberg Mini throws in a 5-inch full HD (1080 x 1920p) IPS display making the handset one of the most sought after displays in the local market. It'll be powered by a 1.5GHz quad-core MediaTek MT6589T procesor and a PowerVR Series5XT graphics player. Plus the 2-gigabyte of RAM will instill inferiority complex to other sparkling phones around. Other internals also include the 16-gigabyte ROM for you multimedia storage, 13-megapixel rear camera with BSI sensor and 5-megapixel front camera. A few downside might hold potential buyers though - no microSD card support and 2000 mAh battery (for a ful HD phone). Not bad for a Php 12,888-handset. Iceberg mini also supports dual-SIM capability with "Hot Swapping" - no need of turning off the phone while swapping SIM cards. This is an interesting phone for a reasonable price. How about you? Are in in to get hold of this icy treat?